I'm thankful for a lot of things, among them are my loving family, and my cozy home. I'm also thankful for my quirky little town. 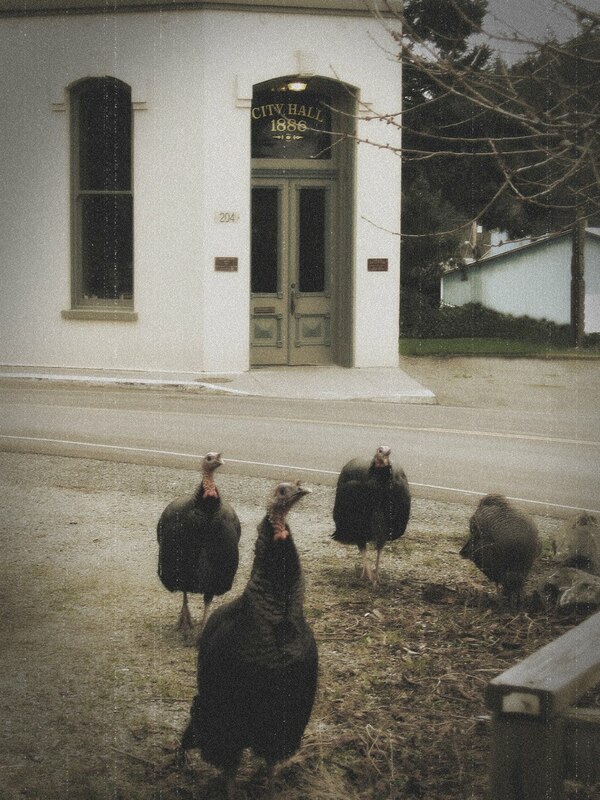 We have local wandering turkeys (seemed like a good topic for Thanksgiving). Nobody really knows where they came from exactly, but now they are here and part of the local color. They have been around for a good 10 years or so, and are now even protected by the town since last year when someone came from a nearby city and shot one with an arrow (that raised a whole hullabaloo). Recently we had an explosion in the turkey population, and they shot up from 7 to 14. Opinions varied about what to do with the extra turkeys. Some people are bothered by them, and I would be too if they were pooping down my chimney and messing with my vegetable garden. Others love them and are happy to have them around. 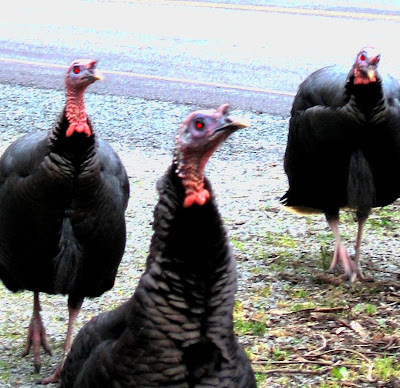 Instead of having open hunting season on turkeys as some suggested, the turkey huggers won out all except 7 of them were sent out to an animal shelter out by the coast with lots of room to roam and breed. 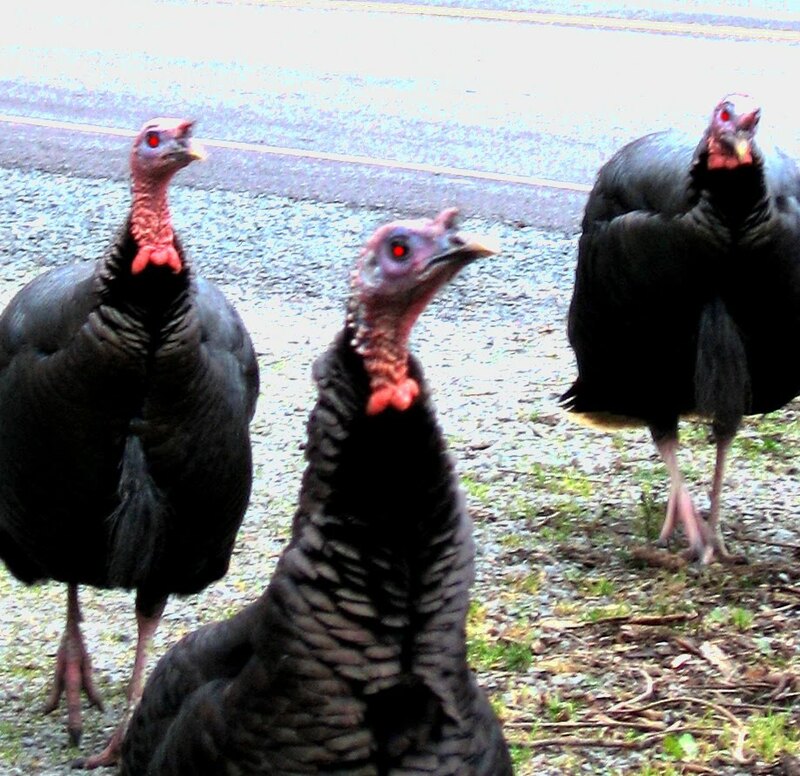 Hopefully they are happy out there, and thankful they aren't on someones table today. For those of you out there that celebrate Thanksgiving, have a happy one! I'm off the have some mmmmmmmm Turkey!